Scones are so very easy to make and so delicious! Great for breakfast, tea time, or just any time you feel like scones. Check out all the sweet and savory scone recipes that we know you will love, any time of day. Scones are best served warm and fresh, split open, and topped with either lemon curd or thick homemade jam and clotted cream (Devonshire cream or creme fraiche). History: It is thought that the name comes from the Stone of Destiny (or Scone). Scottish kings have been crowned upon this stone for more than a thousand years. The present British Queen Elizabeth II was crowned on the Stone in 1953. The original version of scones was made with oats and griddle baked. Today they are flour-based and baked in the oven and come in various shapes (triangles, rounds, squares, and diamonds). 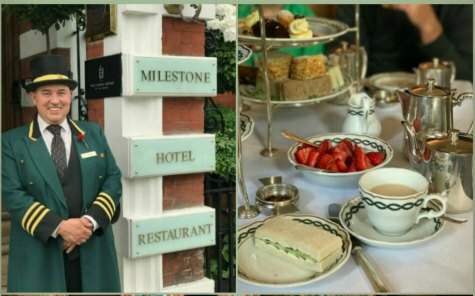 Check out Linda’s History of English High Tea, English Afternoon Tea Menu, and Afternoon Tea and High Tea Recipes. Use fresh ingredients, especially baking soda and baking powder, as it is essential to perfect biscuits. Sift all the ingredients to aerate the flour, making lighter scones. Always measure first and then sift the flour. Sifting adds lightness and removes large lumps. Only use butter and use it straight from the refrigerator. Cut into small cubes, then add to flour. Knead gently with your fingertips until dough just comes together. Do not over handle the dough as will make your scones tough and rubbery. Do not use too much flour to roll your dough out onto. Use a sharp cutter on dough. Do not twist cutter, it causes unevenly risen, lopsided scones. Scones can be cut into any shape you desire. Use a drinking glass to make circles, or cut into squares or wedges with a knife. Dip the edges of the cutter in flour to prevent the dough from sticking. Do not pat the edges of the scone down; instead leave the cuts as sharp as possible to allow the scones to rise in layers. Place cut scones close together on tray to encourage rising, but not spreading. For soft-sided biscuits, bake them with the edges touching. For crusty-sided biscuits, bake them 1/4 to 1/2 inches apart on the baking sheet. A hot oven is essential to cook evenly risen, golden-brown scones with crisp crusts. Bake dough immediately after making. Scones should be eaten within a couple of hours of baking. Freezing baked scones: When the scones are cool, wrap airtight and hold at room temperature for up to one day or freeze to store longer. To reheat, unwrap scones (thaw wrapped, if frozen) and place onto a baking sheet. Bake in a 350 degrees F. oven 8 to 10 minutes or until warm. Freezing unbaked scones: When the dough is made and patted into circles or cut into 8 wedges/circle, put on a cookie sheet and place, uncovered in the freezer. It will take about an hour for the dough to freeze firm. Once the dough is firm, put frozen scones into a zip-lock bag and return them to the freezer. When you are ready to bake, simply take out as many as you want, and let them sit on the kitchen counter on a piece of foil or parchment paper while you preheat the oven. They should only be allowed to thaw only as long as it takes the oven to preheat. Once the oven is preheated, put the scones onto a fresh sheet of parchment paper and bake. It will be necessary to extend the baking time by a few minutes (it could easily add up to 4 to 5 minutes to the baking time – just add it in 2 minute increments until you are sure of your times). This wonderful recipe is from Carol Klinker, Owner/Innkeeper, of the Lasting Impressions Bed and Breakfast in Forsyth, Montana. Fresh or frozen pitted cherries are used in this wonderful tasting scone recipe. This wonderful scone recipe is by Kim Case of Portland, Oregon. The recipe and photo appeared in the Sunset Magazines’s 2004 Recipe Annual. These scones have a pleasing crunchy crust. I slightly adapted this recipe. Since I love dates, adding them to scones make sense to me! These scones are so delicious and tender. They are a delicious treat any time of the day. Recipe by Ellen Easton, a consultant to leading hotels and tearooms, including The PLAZA and LADY MENDL’s. Breakfast, lunch, dinner; almost anytime is an excuse to eat these yummy scones. are loaded with walnuts, and both the scones and frosting are made with cream cheese. Breakfast, lunch, dinner; almost anytime is an excuse to eat these yummy scones. They are loaded with walnuts, and both the scones and frosting are made with cream cheese. Surprise your guests with these delicious Lavender Scones. Recipe by Ellen Easton, an afternoon tea authority. This wonderful scone recipe and photo were shared with me by my sister, Carol Arroyo, and her website called The Baking Pan. Recipe originally from Sunset Magazine, April 2006. These delicious scones are featured in Ellen Easton’s Autumn Afternoon Tea. Both lemon and orange are my favorite ingredients to use in scones. Add the poppy seeds and you have a definite hit! This is the scone recipe served during afternoon tea at the Plaza Hotel in New York. These delicious pumpkin scones are especially good in the Fall and Winter, but they can be enjoyed anytime of the year. What could be more beautiful and decorative than these delicious scones with rose petals? Moist, rich, and tender, these flavorful scones are a favorite breakfast treat at The Stephanie Inn in Cannon Beach, Oregon. Depending on the season, they might be flavored with chopped nuts, dried fruits such as currants, dried apricots, dried cherries, raisins, fresh mango, or blackberries. This is one of our very favorite scone recipes that my daughters like to make for our Mother’s Day Tea.